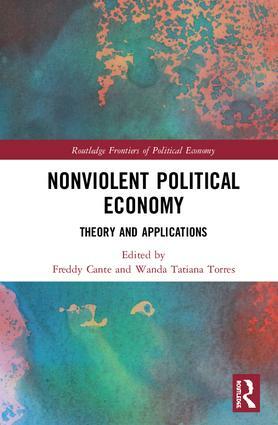 Nonviolent Political Economy offers a set of theoretical solutions and practical guidelines to build an economy of nonviolence which implies a social state of peacefulness, involving minimal violence and minimal destruction of nature. The book provides renewed reflections on heterodox economics, ecological economics, anthropology, Buddhism, Gandhianism, disarmament, and business ethics, as well as innovative initiatives such as Blue Frontiers. It also sets out feasible solutions to rebuild countries that have suffered prolonged conflicts such as Syria, Iraq and Kurdistan. Bringing together authors from around the world, this collection includes new perspectives on the abolition of profit; disarmament; obliteration of the consumer society; expansion of collective property; Buddhist and Gandhian economies; small-scale and artisanal production, the increasing use of clean energies; a gradual reduction in the human population; political processes closer to direct and radical democracy, and anarchy. Discussing cutting-edge developments, this book provides valuable tools to build alternatives to the prevailing models of (violent) political economy. It will be of great interest to a public of critical citizens, students and researchers from a range of disciplines and backgrounds, and all those seeking to understand the fundamental concepts of nonviolent political economy. 10. Civilian-based defense systems: leveraging economic power to fulfill security treaty obligations. James F. Powers Jr.